The relative abundance of the genus Siderastrea and its relationship with temperature and irradiance was assessed around Sal Island (Cape Verde). In some of the surveyed sites, these corals accounted for 80–90 % of the living cover, making it a biotope-dominant organism. Unlike Siderastrea corals from West Atlantic and Caribbean locations, genetic analyses of the dinoflagellate symbiotic partner revealed high specificity between Siderastrea sp. in Cape Verde and the Symbiodinium type C46. 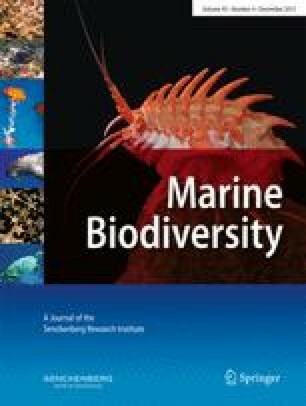 Biotope restriction of the ecological success of Siderastrea in Cape Verde may be explained in part by this host–symbiont partnership, resulting locally in a small optimum ecological niche with specific light intensity regimes. Distinctively, West Atlantic and Caribbean Siderastrea associates with a much broader range of Symbiodinium diversity, suggesting that these symbioses exhibit some flexibility under differing environmental conditions where these corals occupy a wider range of ecological niches. Geographic isolation and/or long-standing environmental conditions are probably responsible for such adaptions and coral–dinoflagellate symbioses. Additional genetic analyses on Clade C Symbiodinium associated with Siderastrea were conducted with the hyper-variable plastid psbA minicircle to resolve phylogeographic patterns that indicate the relative connectivity and/or isolation of these symbionts throughout the tropical Atlantic. We wish to thank Cape Verde Diving, Dunas de Sal and Scuba Caribe dive operators who provided help and logistic support to all fieldwork in Cape Verde. We thank the Brazilian students Tatiana P. de Leon Amorim and Carolina da Rocha Simões for help with collections and processing of samples. D. Thornhill provided several psbA sequences from colonies of Siderastrea monitored near Lee Stocking Island, Bahamas. We also thank all reviewers for their comments and contributions. This research was also part of J.M.’s doctoral research program (SFRH/BD/27869/2009), funded by the Portuguese Foundation for Science and Technology (FCT). Funding for this research was also provided by the IOC-UNESCO-World Bank Targeted working group on coral bleaching and Pennsylvania State University. IMAR-DOP/UAz (Research and Development Unit no. 531) and LarSyS-Associated Laboratory are supported by the Portuguese Foundation for Science and Technology (FCT) under a strategic project and DRCTC-GR Azores through a Pluriannual Funding scheme (COMPETE and PRO-Convergência). Exchange of specimens was made possible by a Material Transfer Agreement between Penn State University and the Universidade Federal da Paraiba and by CITES permit 02/2008 issued by Direcção Geral do Ambiente, Cape Verde.